Once upon a time I took in Mystery as a sensation best left unexamined. Now I experience it as welcomed. I’m strangely comforted when I hear from scientists that human beings are the most complex creatures we know of in the universe – by far! Black holes are in their way explainable; the simplest living human being is not. I lean a bit more confidently into the experience that life is so endlessly perplexing. I love that word. Spiritual life is a way of Dwelling with Perplexity–taking it seriously, searching for its purpose and perils, its beauty and ravages. Spiritual life is dwelling with perplexity. Defusing Hatred Workshop: Hosted at Peace, Wednesday, May 10th, 7:00p. Co-sponsored by Interfaith Council, Peace, and Together We Will. Learn non-violent communication skills, watch informative videos, share conversation and hands on experience. Develop practical skills for responding to hate speech and public occasions of intimidation. Good Shepherd Sunday – Living an Abundant Life, May 7! Forum: Laura Magnani of AFSC/American Friends Service Committee leads our Forum this Sunday at 11:30 – 12:30, then further in depth for those who wish to stay until 1:30. She will speak about the core values that formed the Quaker’s historical commitment to justice (Underground Railroad, women’s suffrage, Japanese internment) and how these values shape their discernment and participation in the Sanctuary Movement today. Keep in your prayers: Margaret Beeler on the death of her mother Betty; the family of Pete Thomsen on his death, Fred and Marlene Garrity, Marshall, Nette, Brian, Gun, Sue, Ed, Shiva, Cliff, Peter, Jerry, Nik, Brian, Enriqueta; the congregation of Korean Church of the Valley as they seek new spiritual homes; and prayers of gratitude for Mashudu Neswiswi) and Masome Makobe who were married in Lwamondo Parish this past Sunday! Healthcare Community Meeting: Saturday, May 20th, 10:30a – 12:00p Join concerned citizens and allied organizations for an educational forum– Health care is a human right in all industrial countries except the United States. 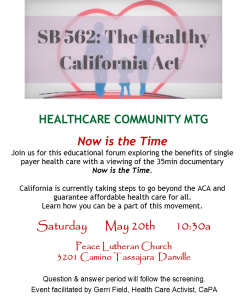 Come watch the 35 minute documentary “Now Is The Time” and learn how the US can join the rest of the world and provide its residents with universal health care. CA is currently taking steps to go beyond the ACA and guarantee affordable health care to all for life. Learn how you can be a part of this movement. Question and answer period will follow screening. Event facilitated by Gerri Field. Health Care Activist, CaPA. Our next Family Service is on Mother’s Day, May 14! Tyme for Tea: We meet again for Tea on Saturday, May 13th, 2:30p Cost $40 per person. We’ll meet at 1:30p at Peace to carpool. Embodying Prayer Retreat: San Damiano, May 13th, 10 – 4:00p with Kaleo & Elise Ching and Pr. Steve as leaders. Come learn and enjoy the whole-bodiness of prayer through the gift of incarnational qiqong. First Friday Films presents The Brand New Testament, this Friday at 6:30 pm: A playful, dark satire in the style of Monty Python meets Moliére. The film takes us on a farcical romp straight through current religious thought to something completely different. If you can suspend your disbelief and poke some fun at religion you will see what one little girl can do with some help from her mother and famous brother (J.C.). Shortlisted at the 2016 Academy Awards for Best Foreign Film, written and directed by Jaco Van Doramael. The Pacific Choir performs Bach’s Cantata 80 (Ein feste Burg ist unser Gott) on Saturday, May 20 at 7:00 pm at the Lesher Center for the Arts in Walnut Creek. Tickets are free but you must sign up with Peace to receive your ticket in advance. (Call/email the Office or Sign Up on Sunday.) Donations for the evening will support the Cleft Palate Foundation. You may invite friends to join you. Jazz Church West presents Clairdee and the Ken French Trio this Sunday, May 7 at 5:00 pm. An elegant and lovely evening awaits you. You have never been to Jazz before? Now is the time to begin. SOLAR CELEBRATION – Save the Date! 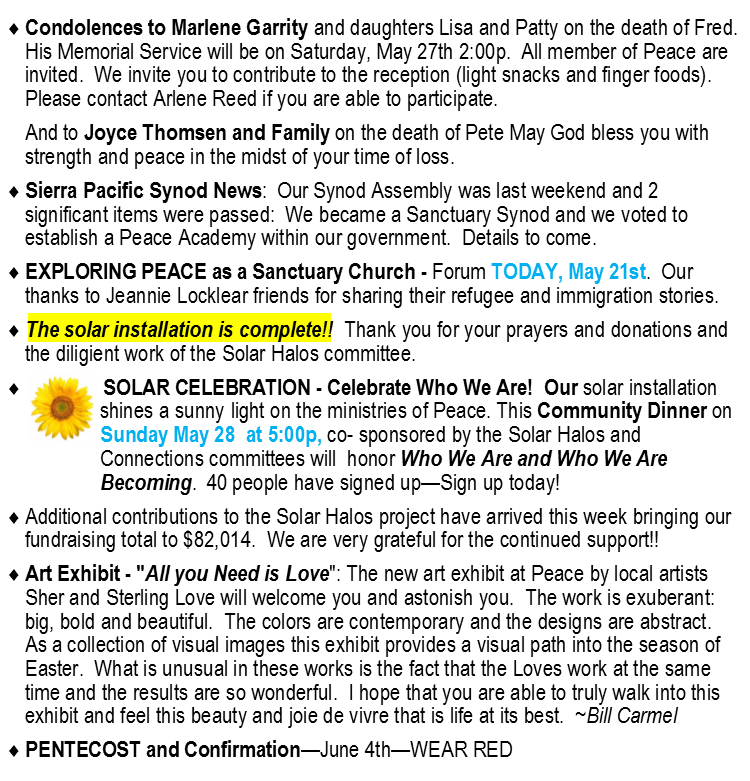 Come celebrate our solar installation and the sunny ministries of Peace. With a Community Dinner on Sunday, May 28 at 5:00p. Stay tuned for details!